Sahi Pro v5.1.0.0 - What's new? abstract Sahi Pro v5.1.0.0 is a major release and contains many new features and bug fixes. Sahi Pro V5.1.0.0 adds support for the latest IE 11 browser. Most browsers have implemented/upgraded their CORS support/implementation. Sahi Pro has updated its CORS support to handle HTML5 websites with cross domain AJAX requests. Specifically, Access-Control-Allow-Origin errors that used to happen with older versions of Sahi Pro have been fixed. Say Hello to the next generation suite! selectively. You can now data drive multiple scripts simultaneously. Sahi's documentation has been rewritten. APIs have been covered extensively. Documentation is now available locally as part of the installation. It can be accessed by clicking the "Docs" link on Sahi Dashboard. test scripts in the language of the business and hide away implementation details. The Scenario Editor takes it a step further by providing a web interface to manage such files. It provides autocompletion of function definitions and highlights errors. Sahi Pro can be used to create simple documentation with screenshots. Manual testers can use this as a tool to create a knowledge base for other manual or automation testers. Object Repository files can be configured for individual scripts from the Controller during recording. Sahi Pro's Installer can now upgrade installed Sahi to a newer version. During an upgrade, the userdata folder is not overwritten, thus preserving user scripts and settings. Sahi Pro can launch multiple browsers in the same session when needed. _launchNewBrowser launches a new browser instance. The new instance does not share cookies with the base browser. 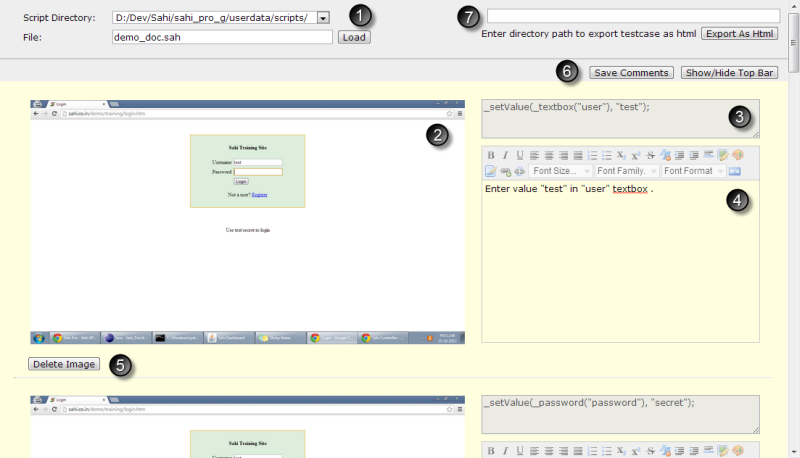 This allows testing functionality like chat where 2 simultaneous users need to be logged in into the system. Once launched, steps can be directed to different browser instances via _selectBrowser. With these APIs you can access WebServices easily, instead of using Java code. Database connection pools, thread pools, better memory management etc. have been added to make Sahi Pro lean, fast and stable. If you use mysql or mssql as the reporting database, performance improvements can be significant. Sahi now integrates with Robot Framework. Sahi now integrates with Microsoft Test Manager(MTM). Added ability to change controller mode from Info tab in the controller. Added Anchor button on ruby and java controller. Added "Compare logs" button that compares the logs of 2 script files. Added support to identify elements using multiple attributes in Sahi Ruby driver. Added advice on _setXHRReadyStatesToWaitFor on clicking the "Diagnose" link in the Record tab of the controller. Fourth argument to specify encoding added to _writeToFile API. _expectConfirm and _expectPrompt APIs can accept regular expression. _rightOf, _leftOf and _under APIs upgraded to accept bounds in flex. Added bat file /userdata/bin/clear-ie-history.bat to clear IE History. The ant target for clearing IE history has been defined in /demo.xml . The target name is "clear-ie". lock, unlock, selectRange, selectTextRange, hr, font, collect APIs added to Sahi Java driver to reflect _lock, _unlock _selectRange, _selectTextRange, _hr, _font, _collect APIs respectively. select_text_range, select_range, selection_text, left_of, right_of, left_or_right_of, above, under, above_or_under, collect APIs added to ruby driver to reflect _selectTextRange, _selectRange, _getSelectionText, _leftOf, _rightOf, _leftOrRightOf, _above, _under, _aboveOrUnder and _collect APIs. Sahi identifies elements through its label. If the HTMLFor property is specified for the label or if the element is the child of the label, Sahi identifies the element based on the label's name also. Ability to add bounds added to _leftOf, _rightOf, _leftOrRightOf APIs. When scripts fail in a suite filename.suite, a file called filename_failed.suite is automatically created with failed scripts. Previously, one had to specify the failed suite name. This caused problems in filepaths during distributed runs. We have now removed the older failedScriptsSuite parameter from drun, testrunner and ant. A new parameter originalSuitePath is added that specifies the original suite path. originalSuitePath is used by Sahi to generate the failed suite (after adding _failed to the filename). warning You may need to change your existing ant targets to reflect this. Have a look at playback on desktop and jenkins-sample.xml for usage. Added executeSahi API for Sahi Java driver and execute_sahi API for Sahi Ruby driver. Statements in Sahi script can be executed using this API. eg. Use this in place of b.execute and @b.execute_step since you are no longer required to prefix Sahi APIs with "_sahi". This allows you to directly copy code from the Controller (Sahi mode) and use in your scripts. _windowAction API now accepts width and height as additional optional parameters to resize the browser window. Recording in Java and Ruby now append b. at the start of accessors. While recording, Sahi now uses b. instead of browser. as prefix. (b. saves space/characters while working on the Controller). Opening correct file with external script directories. Fixed showing title for offline script report. Fixed Controller opening in main page. Fixed update query in persist(). _cell API fixed for spark grid. _cell API fixed for flex grid. Fixed _setValue API compatibility with all HTML5 elements. Assert button of Controller fixed for applet. Fixed ++ and -- operators' usage in scripts. Fix for cookie containing comma issue. Bug fix for UA compatibility for IE. Start URL field on Sahi Start Page fixed for Enter key press. Fixed _writeToCSV to append newline if already not there.